I've signed up for many free magazines through freebizmag.com, but only select people actually receive the subscriptions. Well, color me dandy when I saw this magazine in our mailbox! I signed up for this for Jason, and he read it in one sitting as soon as we got it. Most of the freebies we get in the mail are for me, but I was super pleased that we actually got one that he can enjoy as well. 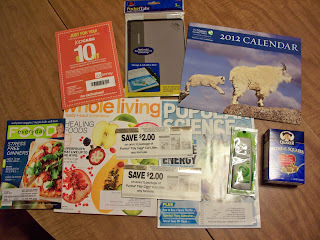 We received another free issue of Whole Living and Every Day Food. You can earn points at RecycleBank and redeem points for these issues. If you're a new member, you can earn enough points to redeem for these subscriptions within about a half hour. You earn points by taking quizzes, interactive diagrams of ways to green your home or vacation, etc. Super easy and fun. Garnier sent us a free sample of shampoo - samples go right in the shower so the next time I shower, I just use whatever sample is in there. This saves me a day's worth of shampoo, and the house doesn't get cluttered with samples. Another good way to use these samples is to put each type of sample (shampoo, conditioner, body wash, body lotion) into a separate container and when your family goes camping or traveling where these things wouldn't be provided for you, you can take along your samples for easy use. Jason and I were both excited to receive a $10 off $10 purchase at JCPenney's. We're going this coming Saturday to get an item for free or close to free. We'll likely buy Jason a screen printed t-shirt. I mentioned here that Nature Conservancy just randomly sends Jason free stuff, and we were both excited to receive a free 2012 calendar. The calendar currently in our kitchen is the 2011 Nature Conservancy calendar (also sent via mail for free). If they keep this up, we'll never have to buy another calendar! Jason's planning to eat the sample of Quaker Oatmeal Squares. He said he heard they were really good. The samples of cereal we've received are pretty small, but what can I say? They're free - who cares?! Through Facebook, I signed up to receive a free sample of Avery Pocket Tabs with Storage. This was a pretty generous sample. We received several of the tab with storage pockets and plan to use these in our price book. Currently, our price book is organized alphabetically, but with these, we're thinking of organizing the pages into categories, like bath and body, household supplies, etc. 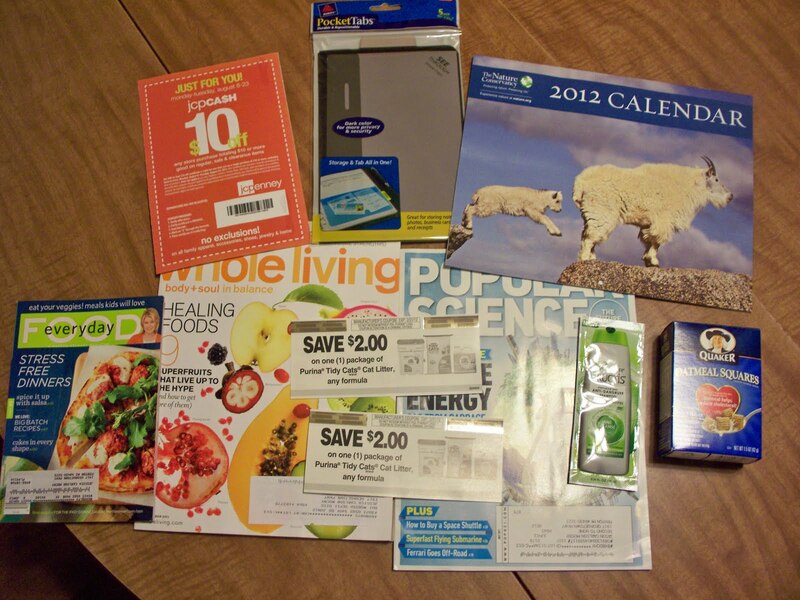 and putting coupons relevant to that category in the pocket. As I talked about in "Living Within Your Needs but Below Your Means" here, we're already working on our 2012 household budget. As part of our budget now and going forward, Preston, our darling five-year-old cat, gets an allowance every month. His allowance is pretty generous, and he usually has money socked away in an envelope in the house in case of an emergence hospital or vet visit. But now, he's about to have an even bigger savings envelope! His allowance never has to allow for cat litter again. Purina has, for the past two years I'm told, been running a promotion where you can call 1-800-PURINA, talk to a representative and request two $2 off Tidy Cats litter coupons. This is the litter brand we are currently using, although through the use of our price book, we discovered Walmart has an off brand that is about half the price per ounce. Since Preston is, shall we say, picky, we weren't sure whether to switch brands, but with the use of these coupons, we can buy little bags of cat litter for $1.77, and with the Walmart coupon policy, the other 23 cents will be overage toward our total purchase. Since we only change his litter every once to two months (we clean it twice a week), he will end up with a stockpile of litter as well. Once he has a big enough stockpile, we'll be able to donate some of the litter to cat rescue shelters. Next week, in addition to sharing what we received in our mailbox, we'll also share how to handle freebies and take care of them so they're not cluttering up your foyer, mail area, etc.